The Driveway Patrol is Currently Selling Like Crazy on TV Under Different Names! 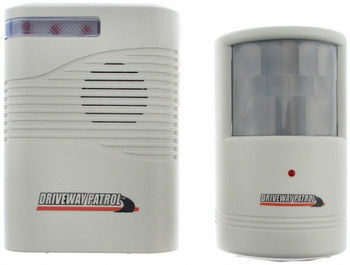 The Driveway Patrol is great new 2 piece product will alert you if a car or person passes by the transmitter. Simply place the transmitter near the entrance to your driveway, anything passing by the transmitter will case the receiver to sound a pleasant chime. The transmitter can also be placed by the front door to alert you if small children (or big children at night!) try to leave the house. Business owners can place the unit by the front door and be alerted when customers enter the store while working in the back. The drive way alert installs in seconds just place the transmitter outside and the receiver inside. The drive way alert uses wireless technology so the transmitter can be palce up to 400 feet away from the receiver. The transmitter uses Passive Infra-Red (PIR) to detect motion. The transmitter measures in at 4 1/2 inches x 2 1/2 inches x 2 1/2 inches. The receiver measures in at 4 11/16 inches x 3 1/2 inches x 1 1/2 inches. The transmitter requires 1 9 volt battery that is not included. The receiver requires either 3 C batteries that are not included or a 4.5 volt adapter that is not included.